TeleSound has been running a campaign on Kickstarter, the largest crowdfunding platform for creative projects. More about Kickstarter. Since the launch of Kickstarter in 2009, over $450 million has been pledged by more than 3 million people, funding more than 35,000 creative projects around the world. Every project creator sets their project's funding goal and deadline. If people like the project, they can pledge money to make it happen. If the project succeeds in reaching its funding goal, all backers' credit cards are charged when time expires. If the project falls short, no one is charged. The platform is originally from the US, but anyone can back a project. TeleSound was a new way to communicate with your friends and family in a casual or exclusive way, by simply using sounds. It was great to send sweet thoughts to your loved one, poke friends, share your feelings, surprise your cat, play with your kids or annoy your colleagues! You could have backed the project on Kickstarter to get your hands on one of the first TeleSounds to be produced for $34 (shipping included). TeleSound connected wirelessly to your smartphone or tablet using Bluetooth 4.0 (see specs for compatibility). 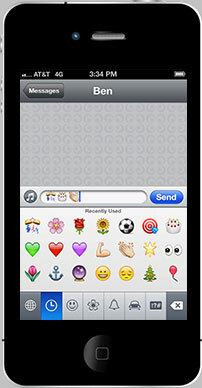 When it was connected, anyone that you authorized could trigger sounds on your TeleSound from anywhere in the world, by sending a series of icons from a free iPhone/Android application. It was like text messaging with Emojis, transformed into sounds. No friends? You could use your TeleSound as a soundbox with the "play" mode! Once it was peered with your smartphone or tablet, your TeleSound connected automatically when it was less than 30 feet away (10 meters). You’d never miss a sound message: as soon as your TeleSound (re)connected, it got back online and messages received while offline were played automatically. The senders would also receive delivery confirmations. Fast and easy: you could go offline by turning your TeleSound over. 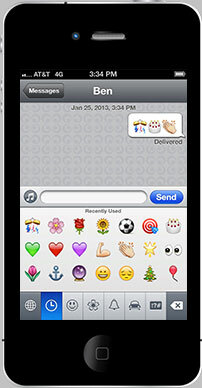 Replayed the last message with a simple “moo box” gesture. 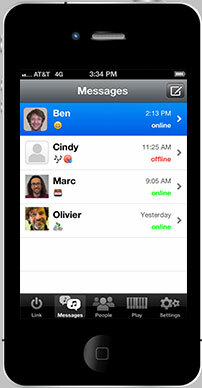 The history of messages received, volume and privacy settings were controlled via the app on your smartphone or tablet. TeleSound contained over 1,000 sounds carefully designed to express a wide range of emotions and situations. From fun to poetic, from meaningful to musical. 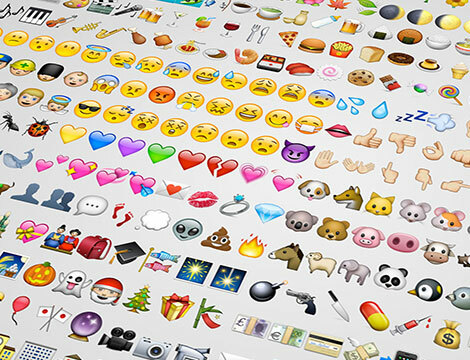 The sound vocabulary was based on the standardized Emojis - which are an extended set of emoticons originally coming from Japan. Every sound corresponded to one Emoji and was graphically represented by it. TeleSound was full of surprises: most sounds have variations, so you did not hear exactly the same sounds all the time, and certain sounds combined into composite sounds. For example, when you sent several laughs in a row, they would combine into a gigantic laugh. TeleSound came in four colors: orange, red, yellow and blue. TeleSound was powered by 2 standard AAA batteries that last for months, depending on your usage. The TeleSound app was running in the background of your smartphone or tablet and had been carefully optimized to save your device's battery life. 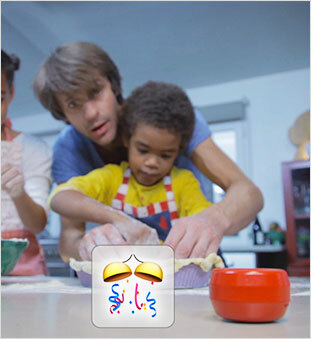 To send sounds, you just needed a free app running on any Apple or Android smartphone or tablet. (*) some specifications could have changed a bit, but don't worry, you would not have noticed the difference! On the Kickstarter project page, you could find several options to get your hands on a TeleSound before everybody. One TeleSound in your choice of color (orange, red, yellow or blue). The first 500 backers could have gotten a free exclusive soft fabric protection bag. This included worldwide shipping. Two TeleSounds in your choice of colors (orange, red, yellow or blue). Four TeleSounds in your choice of colors (orange, red, yellow or blue). The Kickstarter project also offered exclusive limited rewards at $500 and $1,000. The happy few would have had the unique possibility to have a personal input on the final product, by selecting a combination of emojis and its corresponding sound, or by choosing the sound of one the 20 emojis that we have reserved for backers.